Red is a statement color. It is associated with love and passion and can be a bold expression of your feelings. It’s also a fabulous color to wear to brighten up your world and give your day a little energy boost. So, what better way to add some radiant red to your wardrobe than with a stylish piece of jewelry! Red earrings are the ideal way to go when you’re looking for a little touch of color with a fiery expression. Red earrings can be dainty and feminine, as well as being bold and sparkling. There are so many to choose from that there will be a perfect pair of red earrings for every occasion you can think of. So, here are 9 beautiful red earrings you need to see. If you want to add a little touch of red to your wardrobe, then these cute little red earrings are just what you need. They’re feminine and stylish and have just the right amount of sparkle for any time of the day or night. These beautiful earrings feature a bright red rose surrounded by clear rhinestone crystals and simulated pearls. 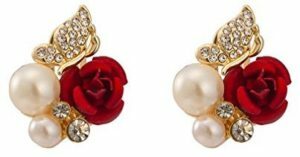 The stud earrings are gold plated with yellow gold, which gives them a glamorous appearance and helps to make the red rose really stand out. These earrings are large studs, measuring just over an inch long and just over half an inch wide, so they’re sure to make a statement. These red earrings are suitable for everyone and can even be used as clip on earrings, for anyone who doesn’t have pierced ears. They can also be used for pierced ears, so you’re really getting a two for one bonus! The pearls and crystals give these earrings an elegant look that will go well with either a chic dress or a laid back casual style; it’s really up to you! These adorable little cherries are just what you need to add a sparkling splash of color to your day. They’re fun, chic and radiantly red, so what more could you ask for! Plus, cherries are super on trend right now, so you’ll always be casually cool. These cute little red earrings are just three quarters of an inch long and wide, so they’re extra dainty but wonderfully noticeable. 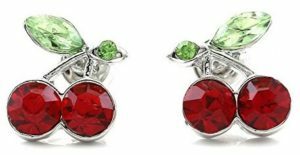 These stud earrings feature red rhinestone crystals on the cherries and little green rhinestone crystals to highlight the leaves. The crystals are set on a silver tone metal, which is crafted into the shape of a cherry, and the earrings have plastic disc backs, to help keep them secure on your ears. These darling little earrings will add a lovely, fruity touch of color to your wardrobe and their small size means you can wear them pretty much anywhere. You could accessorize with more cherry themed pieces or just wear them with your jeans and favorite T-shirt! They’re so cute you can wear them wherever you go! Dazzle everyday, no matter where you venture, in these fabulous little red earrings from StarK. They’re just the right size to make them ideal for any occasion, be it formal or casual, and with this kind of sparkle, who’s to know that they’re not real rubies! 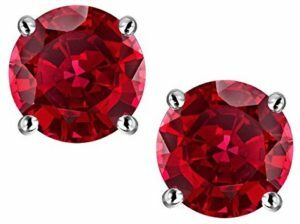 These beautiful red earrings are little studs with a sparkling red created ruby, set in 14 carat white gold. These synthetic gemstones are multi-faceted to create extra radiance and give the illusion of a genuine ruby, and everyone will notice these dazzling jewels on your ears. The earrings have screw on backs, so they’ll stay on more securely, meaning you don’t need to worry about losing your earrings if you catch them on clothing or anything. These gorgeous earrings have a glamorous but elegant appearance, which makes them great for wearing everyday. They’d add the perfect touch of color to any wardrobe and would definitely glam up any casual styles. These would be just ideal as a delicate accessory for wearing with a patterned outfit, when you don’t want anything too overpowering. They’d also make a fantastic gift for anyone who loves a bit of glitz and they even come beautifully packaged in an adorable little jewelry gift box. Get in that sweet, festive mood with these fabulous red candy cane earrings! And who says candy canes are just for Christmas? With these little sparklers you can wear them all year round and spread good cheer wherever you go. These beautiful red earrings feature a cute little candy cane adorned with red and clear Swarovski crystals, giving them that traditional striped appearance. The sparkling crystals are set in platinum plated silver, which adds to the radiance of the earrings and makes them extra durable. The earrings are dangle earrings with a leverback closure, so they’ll stay safe on your ears and be less likely to fall off. They are a fantastic size, measuring just under an inch and a quarter in length, so they’ll stand out beautifully as they hang from your ears. These red earrings would be ideal for wearing to holiday parties or just on a general day, if you’re feeling sweet. They’re stylish and elegant enough to wear to more formal events, giving you that festive edge, and they’d be perfect for any winter family gatherings, as well as heading to the mall. They even come in a little gift box, so you can easily give them out as presents for your friends. If you’re looking for a glamorous piece of jewelry for a special occasion, then these gorgeous red earrings could be just what you’ve searching for. They have an elegant design that will look stunning with a chic dress and they have enough glitz to compliment even the most fabulous of outfits. These sparkling earrings are crafted in sterling silver with a 14 carat yellow gold design, known as a love knot, that sits above the silver heart. 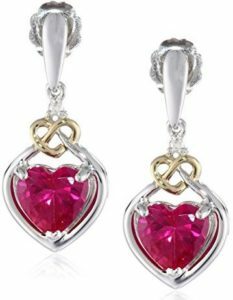 Within the silver heart sits a radiant red created ruby and above the gold love knot sits a genuine white diamond, which gives the earrings even more luminosity. These earrings are drop earrings, so they will dangle from your ears and will catch the light beautifully. These red earrings would be a fabulous piece of jewelry for wearing to a sophisticated event, as they would add a delicate touch of color to your style, as well as being elegant and dainty enough to perfectly compliment your chic style. They would look fantastic with a more formal wardrobe but would also add a stylish touch to any smart, casual styles, making them the ideal earrings for wearing out to lunch or dinner. With the love knot design, these earrings would also make a wonderful gift for a loved one and they come ready to wrap in a lovely little gift box. For Disney fans everywhere, these gorgeous red earrings would be the ideal gift. They’re cute, stylish and will let anyone show off their fun, playful side in a charming and sophisticated way. These red earrings feature a sterling silver stud carved into the shape of Mickey Mouse’s face and ears silhouette, giving that image that is synonymous with Disney. Mickey’s face and ears are decorated with sparkling red rhinestone crystals, adding a touch of sparkle to that Mickey design. These little stud earrings are just over a quarter of an inch wide and long, so they’re extra dainty and a great size for wearing everyday. The backs of the earrings are friction back posts, so they’ll have a bit of extra security in the event of them being caught on clothing. These cute red earrings would be suitable for any Disney fan in your life and their small size makes them ideal for wearing to work or school, or anywhere you need a stylishly delicate little pair of earrings. They come fabulously packaged in a colorful Disney jewelry box, so they would make an awesome little gift! The simulated ruby stone would also make them ideal as a gift for anyone with a July birthday, but you can also get them in a range of other birthstone colors, so all your friends can have a different color! Now, for anyone who loves a cheeky glass of wine or two, these are the ideal accessory! These little red earrings will show off your fun loving personality and get you in that shining party mood in no time. These red earrings feature a gorgeous little red wine glass crafted in a gold tone metal, with red enamel to detail the wine and champagne colored Swarovski crystals to add extra sparkle and glitz. These fabulous earrings dangle from a hypoallergenic hook and measure around an inch and a half in length, so they’re safe for your skin and will stand out in style. 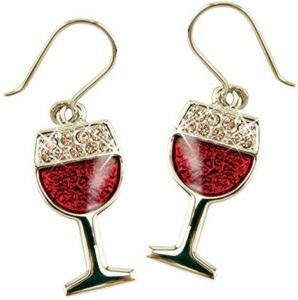 These would be a fantastic piece of jewelry for wearing to a wine party or social gathering and would also be a stylish accessory for accompanying you on your wine tasting trip to the vineyards. These earrings will add sparkle and color to your wardrobe, as well as adding a little conversation piece to your style. Once your friends see these adorable red earrings, they’re all going to want a pair! If you’re looking for a cute little red piece of jewelry to add color to your day and still reflect your personality, then how about these adorable little red earrings from Acefeel. 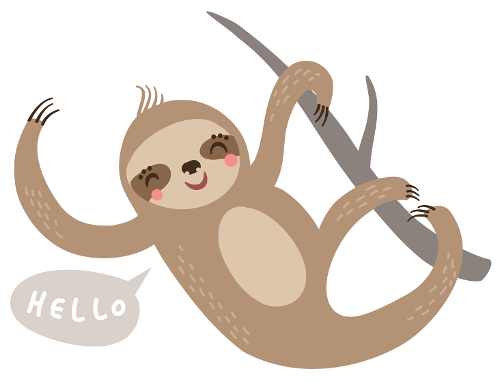 They are not only bursting with cuteness but they’re pretty and a dainty as well. These gorgeous red earrings feature an 18 carat yellow gold metal stud carved into the shape of a precious little round ladybug. The ladybug has a shiny red enamel back with black enamel spots, as well as a black enamel band and blue enamel detailing at the eyes. 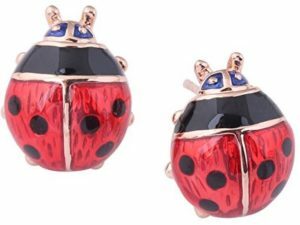 The yellow gold accents highlight the delicate ladybug design and give the earrings a classy look. The backs of the earrings are butterfly backs, so they’ll stay securely on your ears, so those little ladybugs can stand out in style wherever you go. These red earrings are just what you need to jazz up a casual wardrobe and add a pop of color to any style. They’re the perfect little accessory for the summer and will let you show off your fun side while looking stylish and chic. They’re small and dainty enough to wear to work or school and would look fabulous when you’re out and about, doing your daily thing! Even better, they also come in a cute little gift box, so they’d make a fantastic gift for anyone who loves nature and likes to stay on trend. So, you’re looking for something that will reflect your personal style, as well as give your wardrobe a little boost of color. Well, these beautiful red earrings from Lucky Brand will do just that. These gorgeous earrings feature five red multi-faceted simulated stones set in a gold tone metal that dangle in a chain style effect from the fishhook back. The stones are a deep shade of red, which goes well with the vintage inspired gold tone metal. These fabulous earrings have a casual, laid back style that will accentuate your own personal style and will go wonderfully with anything in your wardrobe. Their muted tones means they’re ideal for adding a delicate touch of color to your day, as well as being bold enough to stand out and dazzle on your ears. The earrings have around a 2 inch drop, so they’ll easily be seen but, at the same time, they have a dainty look that keeps them from being too overpowering. They’d look great with other jewelry, and their vintage appearance means they’d look awesome with layered necklaces and a boho chic dress or shirt.